2018 Eagle Fun Run Fundraiser is a SUCCESS! OUR 2018 EAGLE FUN RUN WAS A TREMENDOUS SUCCESS! tHANK YOU TO ALL OF OUR VOLUNTEERS AND SPONSORS WHO HELPED WITH THIS YEARS EVENT. WE COULD NOT DO THIS WITHOUT YOU! Eagle Fun Run is finally here. Please come out and support your child as they run in support of our school. Parking is available off of Doucet Rd. at the rear bus drive. Please come to the welcome tent and sign in when you arrive. Have a look at the graphic above for the run times for each grade level. We look forward to seeing you there! CLICK HERE to download OUR 2018 STUDENT COLLECTION PACKET. CLICK HERE to download OUR 2018 SPONSORSHIP FORM. Our annual Eagle Fun Run serves as the primary fundraiser for our Parent-Teacher Committee. The tremendous buy-in from our students and community ensure that we have the resources to support our school in an incredible way. Check out our latest BIG project completed fall 2017 here! 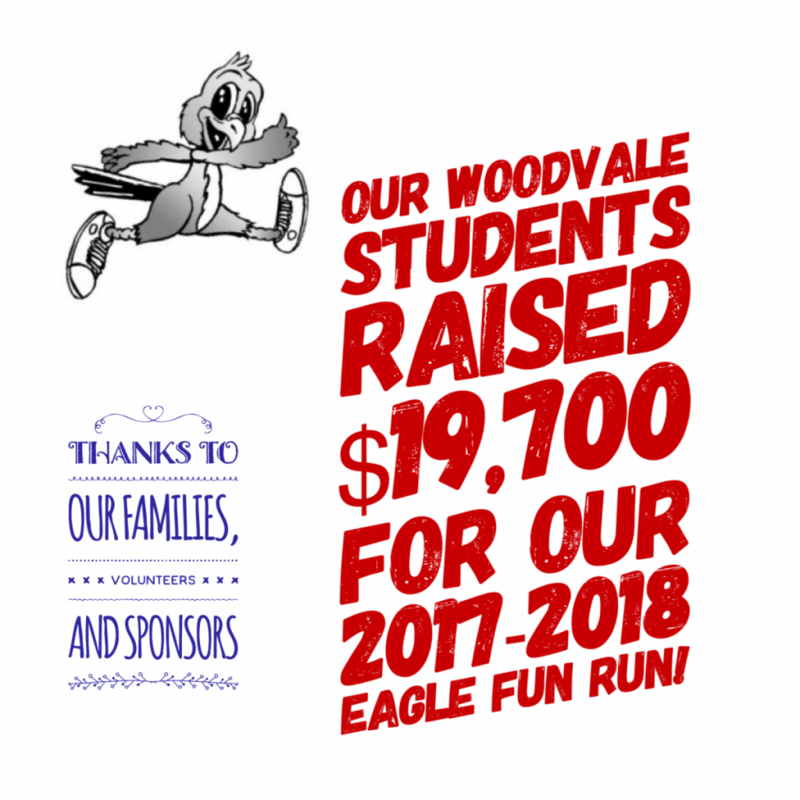 For the 2017 Eagle Fun Run, 9 out of 10 students participated in raising money for this exciting fundraiser. Our 27 community sponsors completely covered the costs associated with the Fun Run, enabling us the put all of the money raised by our kids towards projects which directly impacting the students. 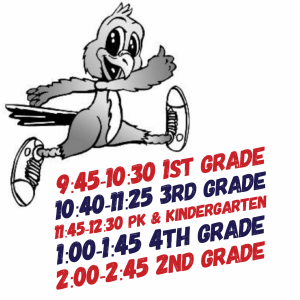 The 2018 Eagle Fun Run will be held on Friday April 20th. Student packets are being prepared now and should be ready for students on Tuesday, March 20th. Once they are available, the forms and information sheets will be handed out to students by their homeroom teachers. Copies of the forms and information sheets will also be available for download on the Forms & Flyers page of our website found here. For more information regarding the 2018 event, check out the video below from our 2018 Eagle Fun Run Chairperson, Nicole Hauerwas. Looking for “just the facts”? Visit our 2018 Eagle Fun Run information page located here for the key dates for this year’s event. Download a copy of our 2018 Eagle Fun Run Announcement here. This is an update to the announcement that was sent home on Monday, February 26th, 2018. Take a look at our 2017 sponsors listed below. Whenever possible, we encourage you to support these sponsors. And when you do, please be sure to let them know how much you appreciate their support of Woodvale Elementary! 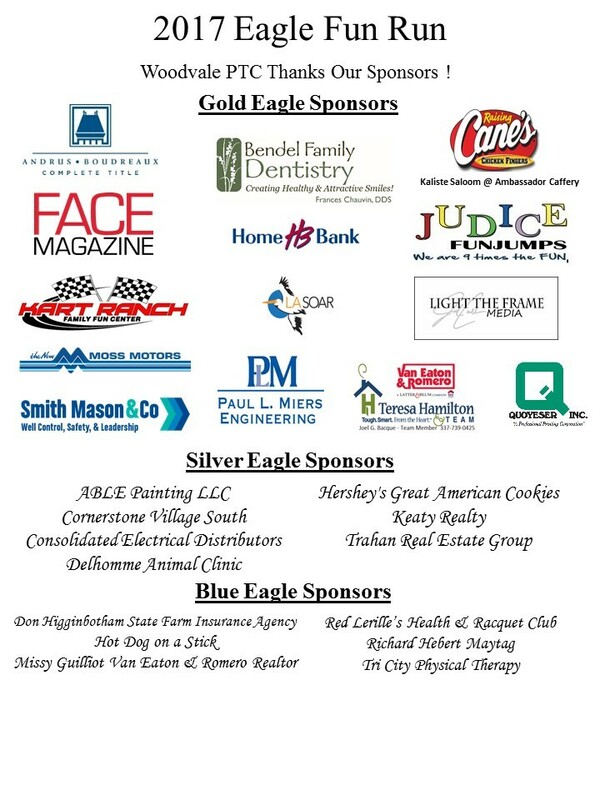 Interested in sponsoring our 2018 Eagle Fun Run? Please email us at info@woodvaleptc.org and one of our volunteers will be in touch with you regarding sponsorship opportunities!